Although scientific evidence proves that Scandinavian settlers reached North America long before and the indigenous population had been living on the continent for millennia, the discovery of the Americas is attributed to Christopher Columbus. His voyages were of great importance since they initiated the exploration and colonization of the American continents – the New World. In the 17th and 18th centuries, many thousands of people decided to leave their home countries and build up a new life in the New World. What were their reasons to do so, and how was their emigration organized? 1 | a) Even today many people immigrate to a foreign country. However, why do people leave their home country? What are their reasons and what do people expect to be better elsewhere? Write a short paragraph. b) Read the text M1. What were the settlers’ reasons for immigrating to the New World? c) Compare your answers of task a) and b). Can you identify any parallels regarding the reasons for emigration? Are there any major differences? The early 17th century marks the beginning of a great migration movement from Europe to North America that lasted more than three centuries. This movement grew from a few hundred colonists in the early colonization peri­od up to a million immigrants per year at its peak. While America was already inhabited by native people, the colonists built a new civilization in North America. Most settlers left Europe for greater economic opportunity, to escape political op­pression or to seek religious freedom. Due to economic difficulties many people in England could not find work. Even skilled craftsmen had problems earning the money they needed to make a living. Living standards dropped drastically because of increasing living costs and declin­ing wages. Moreover, bad harvests and food shortages brought widespread misery. In the 1640s, the arbitrary rule by Charles I. caused the English Civil War. After the triumph of Charles’ opponents under Oliver Cromwell and the execution of the King, many people left England to try their luck in the New World, where they hoped to find gold and adventure. In addition to poverty and the hope for better living conditions, religious persecution played a particularly important role for emigra­tion. During the religious upheavals of the 16th and 17th centuries, a group called the Puritans wanted to reform the Church of England from within. The Puritans, who were English Prot­estants, sought to “purify” the Church of Eng­land and to separate it from the Roman Catholic Church. They demanded simpler forms of faith and worship. This implied, for example, that church services as well as the church buildings themselves had to be simple and plain. Some Puritans thought that they could express their religious belief best by living a simple life. However, the Puritans were hindered from changing the Church of England, and laws re­stricted them from practicing their religion in their own way. Opposing those laws, some men and women were even sent to prison. Many Puritans left England in 1630 to settle in Massachusetts Bay Colony. In contrast to the Puritans, the Pilgrims separated from the Church of England believ­ing that it would never be reformed to their lik­ing. 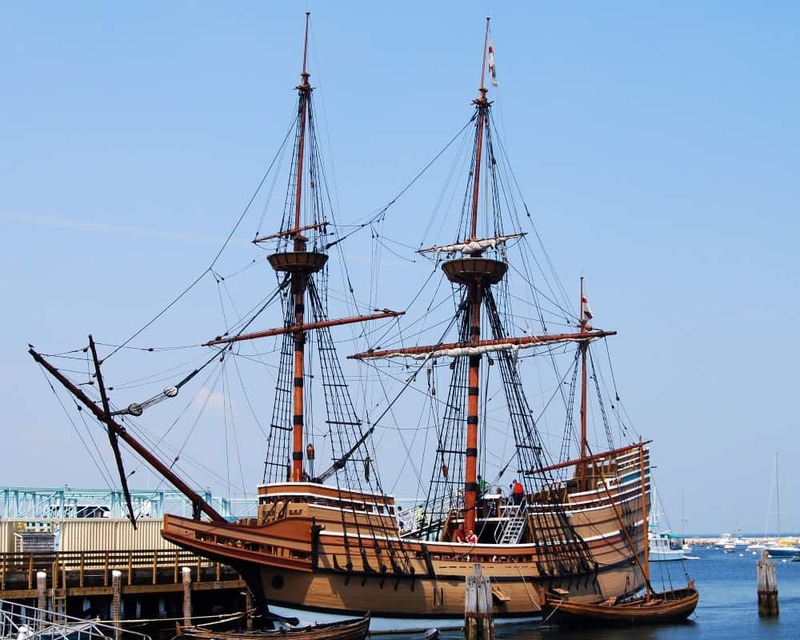 Since the Pilgrims as well were not al­lowed to practice their religion freely, a group of 125 people left England for Holland at the beginning of the 17th century to escape perse­cution and to find more tolerance. They settled in the city of Leiden, but concerned with losing their cultural identity the Pilgrims eventually looked for a new place to live. They decided to imigrate to the New World in 1620 where they hoped to finally find religious freedom and a better life. 2 | a) Read the text M2. Explain the organization of emigration: Who invested in setting up colonies in North America? How did the settlers pay for their journey? Write a short paragraph. b) Evaluate whether the system of indentured servitude was a fair deal or exploitation. Give reasons. If you require more information, click here. After the Spanish had started to explore the New World, the English followed soon after. Some tried to make a fortune as pirates or traders, whereas others left England altogether to establish new colonies overseas. Unlike other countries with heavily invested colonization policies, the English government did not sponsor the establishment of colonies in North America to a great extent. Thus, especially rich men, whose chief motive was profit, invested in setting up the English colonies. They hoped to make profits by shipping supplies (clothes, tools, building material, seed, guns etc.) the settlers needed overseas. The investors made additional profit by shipping goods manufactured by the settlers back to England. Not all colonists had enough money to pay the expenses of transportation and main­tenance necessary for making a start in the New World. In this case, agencies like the Virgi­nia Company and the Massachusetts Bay Company paid the settlers’ costs. Besides tho­se kinds of colonizing companies, proprietors and individual families also made contracts with potential settlers. In exchange, the settlers had to work for the agencies or a contract holder as contract workers for a fixed period of time which usually lasted four to seven years. During this period, the masters provided food and shelter for their servants. After the servants had completed their contractual obligations, they received a payment known as ‚freedom dues‘. The freedom dues usually included small pieces of land, supplies or money and helped the settlers to set up their own homestead. The colonies of Virginia and Massachu­setts were established by chartered companies which were provided with a royal charter. This was a royal document confirming that the com­panies were allowed to colonize pieces of land in North America. The funds of the compa­nies, provided by diverse investors, were used for the colonists’ equipment, transportation and maintenance. Other colonies such as New Hampshire, New Jersey or Pennsylvania initi­ally belonged to proprietors who were mem­bers of the English gentry or nobility. One exception to this is the New Haven colony which was settled by colonists who were rich enough to pay the costs of their families’ and servants’ transportation and equipment them­selves. Historians estimate that half the settlers, especially from the Southern Colon­ies, came to Colonial America under the sys­tem of indentured servitude. Many of the in­dentured servants became subject to violence at the hand of their contract holders. Moreover, given the high death rate, many servants did not live to the end of their terms. Indentured servitude was a major element of colonial la­bour economics. After the American Revolution, the numbers of indentured servants dropped to a minimum.